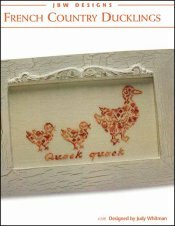 French Country Ducklings [C5881] - $10.00 : Yarn Tree, Your wholesale source for cross stitch supplies. Cross stitch pattern by JBW Designs. Quack Quack! Look out, these three little ducklings are out for a walk. This design is versatile where you can stitch all three ducks, or you can stitch one duck. Don't let these little ducklings quack away before you get them stitched. Stitch count for three ducklings is 116W x 71H. Stitch count for one duckling is 49W x 57H. The three ducks are stitched on #2181 Zweigart Belfast Linen Antique White 32ct.